New Column by Harry & Rosemary Wong! 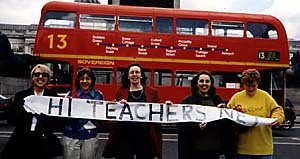 Exclusive - Teachers.Net proudly debuts "Effective Teaching," a new monthly column by Harry K. and Rosemary Wong. More than a half-million teachers worldwide have heard their message. Find out why teachers everywhere recommend their work as indispensable reading! Chatboard Poll: Do You Contribute to End of Year Syndrome?